272 x 205 mm. – 168 leaves, 52 large illuminated initials of two styles, 1 historiated initial, 1 full-page title miniature, and 1 frontispiece miniature. 272 x 205 mm. 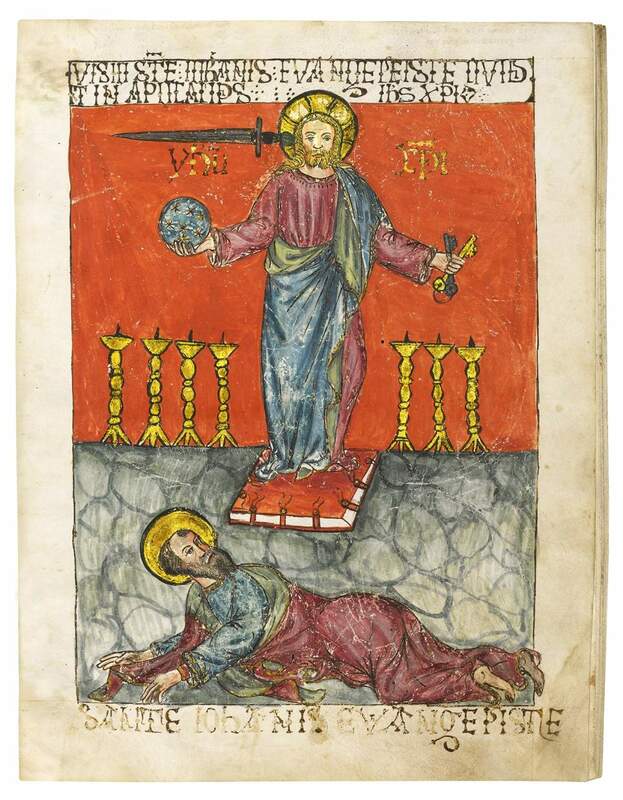 – 168 leaves, 1 historiated initial, 1 full-page title miniature, and 1 frontispiece miniature. The Apocalypse and a commentary upon it by Federico da Venezia. Federigo de Rinaldo, usually known as Federigo da Venezia (c. 1350-after 1401), moved between the convents of northern Italy. A Dominican who matriculated as a doctor of theology at Bologna around 1380, his commentary on the Apocalypse is believed to have been completed in the 1390s on the command of Francesco II da Carrara, Lord of Padua. His commentary is primarily concerned with examining the text and grammar of the Apocalypse – treating it as the only book of the Bible for which Christ was the author and St. John was merely the scribe. Written in a literary version of Venetian dialect, Federigo’s commentary was “one of the very first biblical commentaries composed directly in an Italian tongue” (Luttrell 1964-65). The decoration of this manuscript is diverse in its style. Clearly the manuscript was not completed in a single campaign, and the refined and richly coloured initials from fol. 42 onwards are the work of a north Italian illuminator of around 1470.